Cast: Christian Bale (Moses), Joel Edgerton (Ramses), John Turturro (Seti), Aaron Paul (Joshua), Ben Mendelsohn (Viceroy Hegep), Maria Valverde (Zipparah), Sigourney Weaver (Tuya), Ben Kingsley (Nun). If 2014 is anything to go by, filmmakers just can’t do historical epics like they used to. William Wyler (Ben Hur) and Stanley Kubrick (Spartacus) would appear to have nothing to worry about in the competition stakes. I thought Noah was pretty bad (reviewed here on 5th April), but in retrospect it did at least have a fairly bonkers quality that made it watchable. Ray Winstone fighting Russell Crowe, together with those living stone creatures, had some entertainment value. 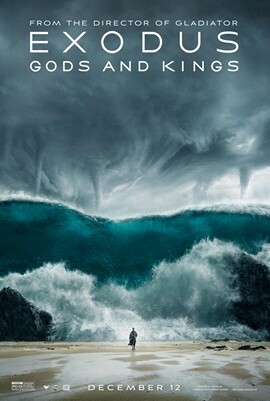 By contrast, the deadly earnestness of Exodus: Gods and Kings, together with the lack of any dramatic tension, makes for an excruciatingly dull 150 minutes. The story begins in Egypt, 1300 BCE, where a bunch of white guys have somehow bucked the regional tendency towards dark skin and rule the roost, keeping a large number of Hebrews as slaves. Ramses (Joel Edgerton) and Moses (Christian Bale) are brothers, though Ramses appears to have senior military ranking despite having less understanding of military tactics. On a trip into town Moses is appalled at the terrible way the Hebrew population are treated, but then it turns out that he himself is actually a Hebrew and not Ramses’ brother at all, a fact that is revealed by a local elder called Nun (Ben Kingsley). When Ramses discovers the truth he banishes Moses to the wilderness. Sunburnt and thirsty, Moses finds water and rest at a tiny outpost in the middle of nowhere. At the watering hole some local blokes are trying to muscle in before a group of thirsty girls, but Moses flashes his imperial sword (not a euphemism) and the men back off. One of these girls has maintained a good moisturising regime and has brightened herself up with some eyeliner and lipstick; guess which girl Moses falls in love with? So Moses marries Zipporah (Maria Valverde), who bears him a son, Gershom (Hal Hewetson). When Gershom is nine, he tells Moses that climbing the nearby mountain is forbidden by God, because mum says so. So of course Moses tries to climb it. In the Old Testament such disobedience would normally be punished with a little mild genocide, but on this occasion Moses only suffers a falling rock to the head and thereafter receives visitations from God in the form of a young boy, Malak (Isaac Andrews). Malak tells Moses that he should journey back to Egypt to witness how bad the social conditions have become. Zipporah isn’t too keen on Moses disappearing on this quest, thinking – not unreasonably – that the whole visitation from God thing was just a delusion brought on by the blow to Moses’s noggin. But back in Egypt, Moses discovers that Malak was right. The Hebrew slaves are suffering badly. Moses gets a group of followers together and trains them up as a fighting force. However, they can’t take on the army directly because they are so badly outnumbered. Therefore, Moses’ plan is to destroy provisions that are en route for the civilian population, thereby making them angry at the rulers and so fomenting instability. This is basically terrorism, of course, but maybe that’s OK when God’s on your side (because, obviously, God takes sides). As it happens, God (Malak) turns up and tells Moses that his methods will take far too long. “Watch this”, says God, “I’ll show you what real terrorism looks like”, and launches a series of attacks on the civilian population, not to mention the local animals. First of all, he wipes out all the fish in the sea. This is followed by plagues of frogs, lice, and flies. Moses visits Ramses and tells him that worse is to come unless he relents and frees the slaves. Ramses says that this is not economically viable, so then God starts to wipe out the livestock and visits plagues of boils and locusts upon the people, as well as hail, thunder, and darkness. Even Moses starts to think that God is going a bit far when he reveals his plan to kill all newborn children, but God tells him that no punishment is harsh enough for those who have enslaved his chosen people for over 400 years. Nonetheless, Moses is able to mitigate the effects of the almighty’s genocidal rampage by advising the local Hebrews to smear lambs’ blood over their front doors as a protective agent. But God’s war crime works: when Ramses discovers that his young child is dead, he relents in the face of Biblical firepower and frees the slaves. Moses then entreats the Hebrews to follow him to the promised land and so they head off into the wilderness with him. By now, Ramses has got his act together again and sets off with his army in pursuit of Moses. Moses gets a bit lost in the mountains and calls upon God for assistance. But guess what? Despite all the help that Moses gave God, God’s nowhere to be seen when Moses needs a bit of help with the old map-reading business. Maybe God tired himself out with all that genocide stuff and was having a rest. Still, somehow Moses gets his people to the Red Sea which – as we all know – conveniently parts in order that they can cross to the Holy land. Moses is reunited with his son and his wife who, when he rocks up at their home, is still wearing full make-up. No sooner has Moses returned when God gets him busy chiselling the ten commandments into lumps of stone. “I quite like that you don’t always agree with me” God tells Moses, thus revealing a bit of a soft spot that the Old Testament God doesn’t normally extend to dissenters. And that’s about it story-wise. I’m not qualified to say how closely Exodus follows the Old Testament story of Moses. However, the tale presented here is seriously lacking in dramatic tension. Moreover, I found it difficult to care about Moses and his battle with Ramses. Christian Bale does a perfectly fine job as Moses, though the story doesn’t really allow him to shine. In fact, all of the actors are somewhat overwhelmed by the combination of CGI and 3D (perhaps the 2D version works better). It is as if Ridley Scott was so concerned about conveying visual epic-ness that the basics of storytelling got left behind. In some films 3D works really well. Gravity is probably the best example. But in Exodus the screen just seems too busy, which is a distraction.